A Family Discussion in San Francisco | whitespace. If a corporation—per judicial opinion—is considered a person, does it follow that it can have a “soul”? If the willingness to consider the social and political impacts of our actions is a characteristic of our company, then perhaps the answer is yes. On April 6th and 7th, members of the Gould Evans family and selected guests gathered in San Francisco for our annual Spring dGroup meeting. This is something we do twice a year: come together in a single location to discuss the issues common to our work, and enrich our practice with the inclusion of diverse perspectives. Our focus this time was the relationship between our work as designers and the political and social environment in which we practice. 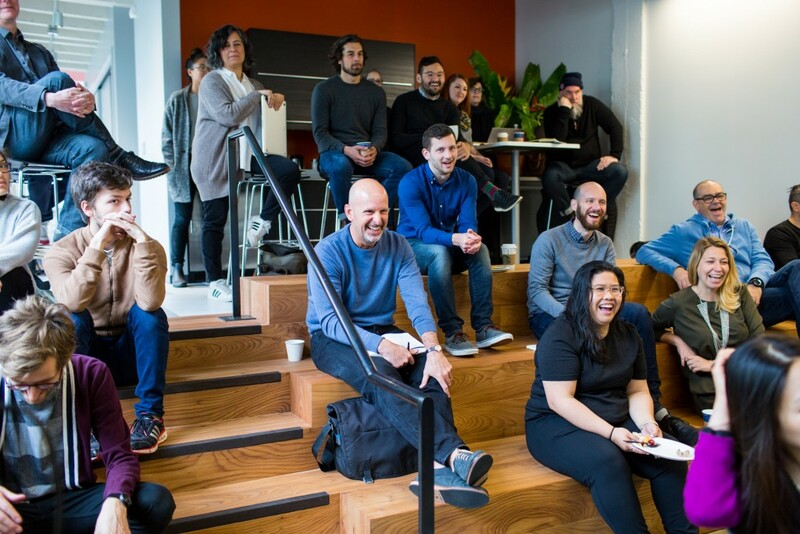 In an atmosphere of openness and dialogue, we recalled our core values, engaged in a spirited conversation, and pushed ourselves to think in new ways about just about everything we do. 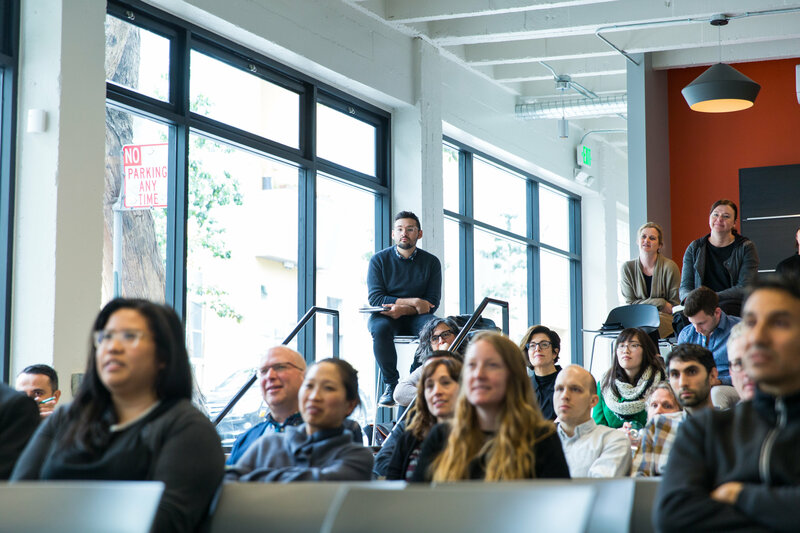 Members of the Gould Evans family and guests gathered in our San Francisco studio to discuss the relationship between design and activism (Image by: Sarah Deragon). Gabe Metcalf, the Executive Director of SPUR, kicked things off. We expected him to extol the virtues of urban San Francisco—sustainability, innovation, inclusion and diversity—which he did. But he also pointed out some of the underlying problems our city grapples with—income inequality, homelessness and housing affordability—and asked us to ponder whether we have brought these problems on ourselves. Are we working hard enough to lessen the cost of housing? Can our transit systems keep up with demand (especially given an anticipated loss of federal funding)? What about the California “anti-property tax” culture (dating from the 70’s)? If we don’t alleviate these pressures, will we begin to lose the tech industry as an economic generator? Are we headed for “utopia or dystopia”? He suggested that, in the long run, our city will thrive. But the short run may be challenging. This was a thought-provoking way to begin. 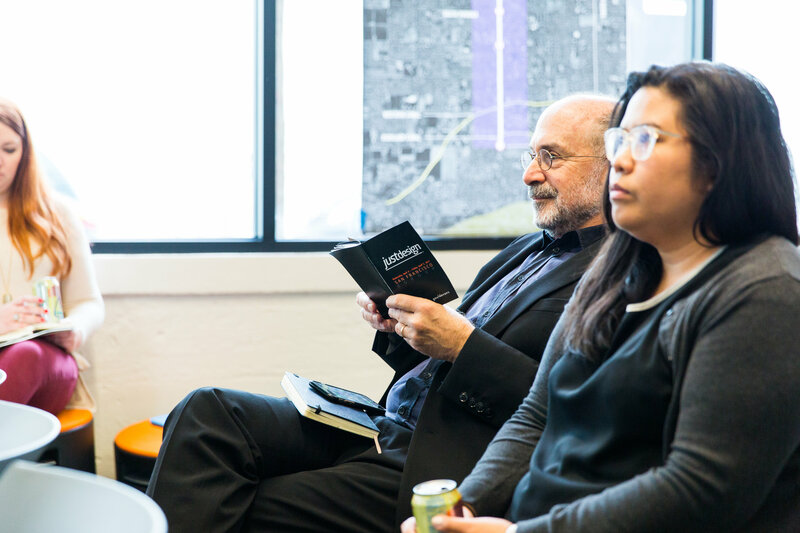 Bob Baum and Reina Reyes, Principal and Associate in the Gould Evans San Francisco studio respectively, listen to a presentation given at dGroup (Image by: Sarah Deragon). The discussion was then directed south to the work of our Phoenix studio. The city of Phoenix is currently engaged in some great dialogue and planning to shape its urban ideal, and we are where we want to be: in the thick of the discussion. Central City South and South Phoenix, directly adjacent to our (still) new studio in the Warehouse District, are about to be transformed by an extension of the light rail system. We seek to help guide this change by actively engaging in dialogue about both the benefits and the challenges for current residents and businesses. We recognize the rich history and value of this community that has been built through generations even though it may not be easily evident to the general passer-by. We seek to help the residents and business through this change to benefit all its constituents. This process warrants custom tools of engagement to understand the complexity of this extension. Will the light rail be a simple utility, or a symbol of new connections? How will the ripple effect of the light rail change the neighborhoods? We are determined to be part of helping do it right. 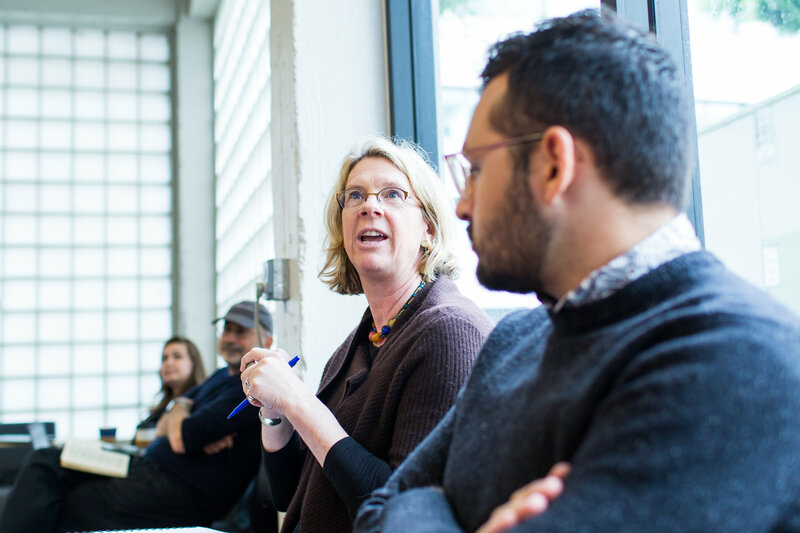 Krista Shepherd and Eduardo Perez, Principal and Associate Principal in the Gould Evans Phoenix studio respectively, chat in between dGroup sessions (Image by: Sarah Deragon). 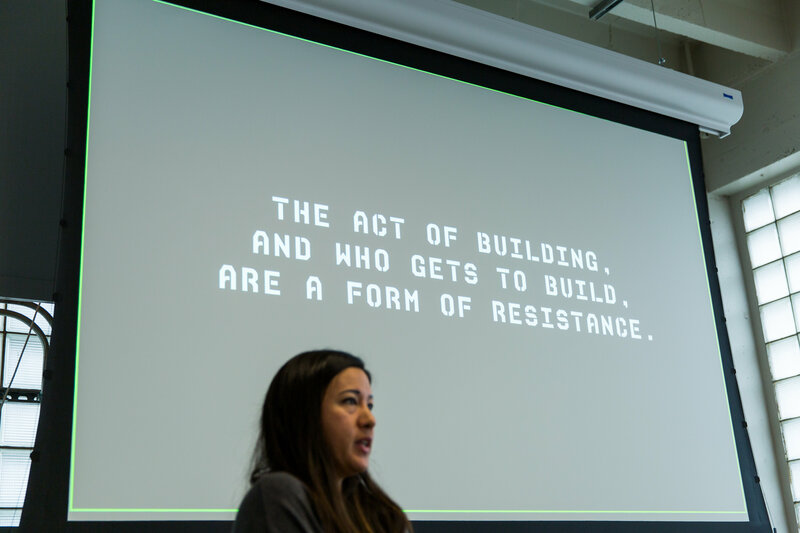 Emily Pilloton, founder of Project H Design, gives a presentation on her inspirational work in Bertie County, South Carolina (Image by: Sarah Deragon). Then, we were on to New Orleans, where our studio is assisting Crescent Care, a community health care provider, to build a new hybrid medical facility for a neighborhood which is underserved. Our discussions centered around how we balance our work: large and small projects; for-profit and not-for-profit; design or program-driven. As in South Phoenix, how do we engage with—and respect—an existing community and culture? How can a new building substantially larger than the surrounding single-family homes be designed to respect the richness of the existing context? How do we measure our success in this regard? 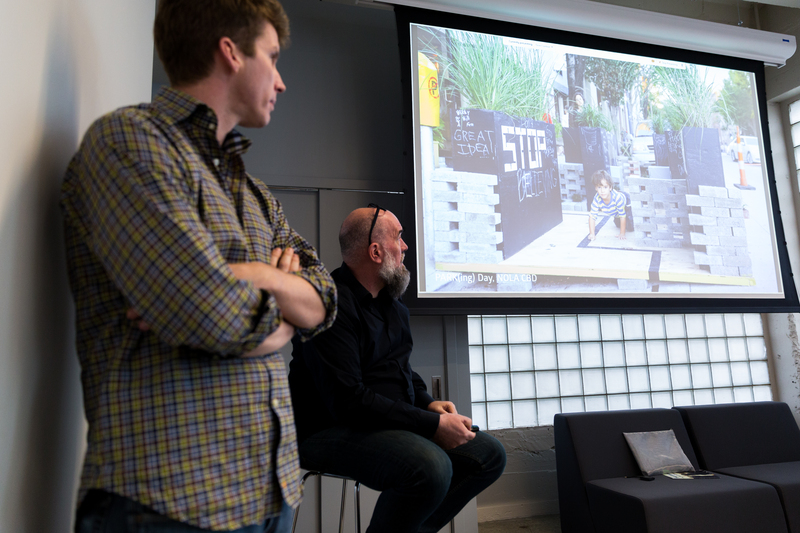 Brian Webber and Robert Riccardi, Associate and Managing Principal in the Gould Evans New Orleans studio respectively, present the Crescent Care project in the context of greater New Orleans (Image by: Sarah Deragon). Our San Francisco studio presented the space we’re creating for Friends of the Children, an organization which seeks to positively change the life paths of at-risk children by providing consistent, one-on-one mentoring from kindergarten through high school graduation. The discussion focused on our efforts to create an environment which responds to these unique needs, drawing on an understanding of the Bayview community which it will serve. How can the space evoke a sense of comfort and connection? How can it reinforce the mentors’ work and simultaneously provide spaces of openness, intimacy and privacy? Is biophilic design part of the solution? What is the symbolic connection to the community? 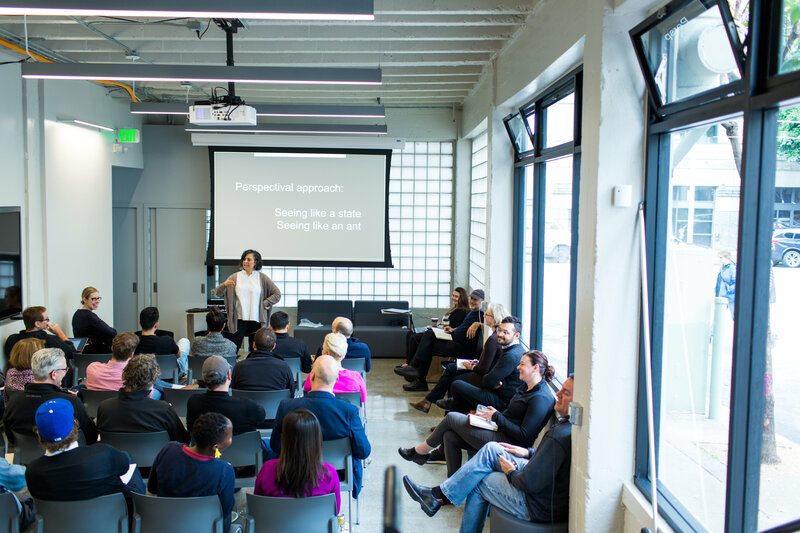 Lauren Maass, Associate Principal in the Gould Evans San Francisco studio, shares her thoughts on how design can be positively linked to social and political activism (Image by: Sarah Deragon). Another guest, Andrew Burdick of Ennead Lab, shared projects and approaches that sought similar goals to our own ambitions of solving problems through design at all scales. From art installations in public spaces to spaces that support veterans take on a new mission as farmers after their service, we found commonality in our thinking. Having explored urbanity, redevelopment, and partnering with non-profits, we then turned our attention to a significant university research building, The University of Kansas Earth, Energy and Environment Center. Providing facilities for scientists whose work seeks to improve our understanding of the natural and man-made environment is a worthy effort. Facilitating the advancement of human knowledge is a laudable part of our work, even though the politics of this work can be complex and sometimes contradictory. Anthropologist Andrea Ballestero leads a wrap-up discussion on ways to “inhabit the tension” of current events and to make activism an ever-present state of mind (Image by: Sarah Deragon). What made the dGroup discussions so honest and engaging was the sense of being in an environment that supports diverse viewpoints, like a family. Design often shies away from tackling complex social issues, but design thinking is an enormously powerful tool for addressing these issues. We’re learning to talk more about them, and to improve our work by doing so. Are we a company with a soul? Can we not just survive—but actually thrive—by letting those values guide our actions and culture? 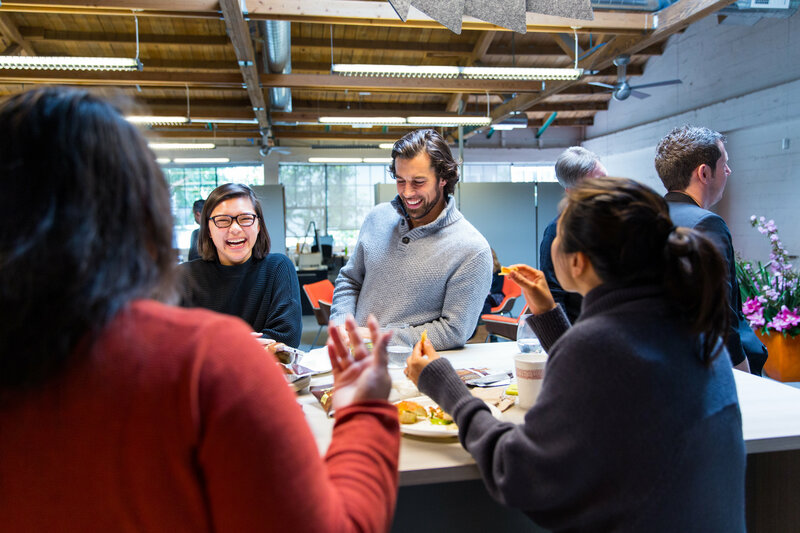 Gould Evans associates enjoying each other’s company during the two-day internal think tank (Image by: Sarah Deragon). Bob, great post. 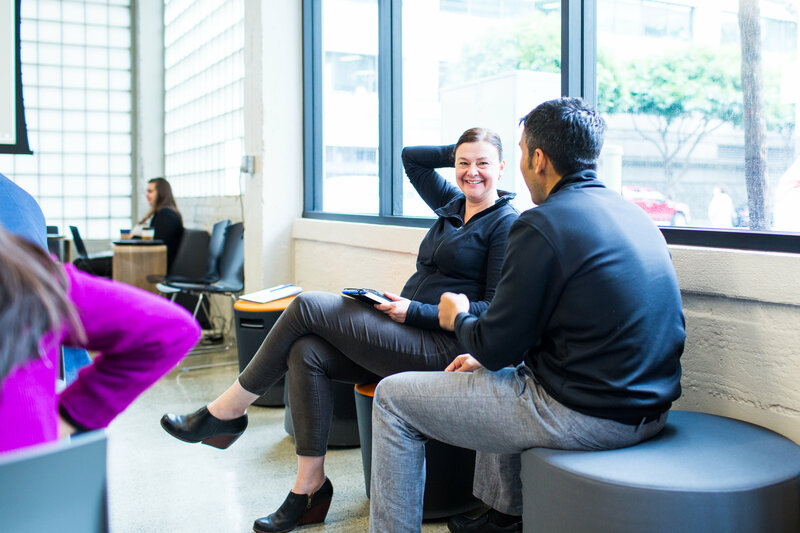 It’s energizing to see the firm’s continuing success, and to see how your SF Studio is flourishing. Best to you and all at Gould Evans.